Snow crunched under my feet. Where had I gone, the morning had been brisk but this was the desert. The snow was wet, the temperature was above freezing. I went further up the gully, crawling around and through a hole to surmount the final chockstone. Everything was covered in snow now as I went hand over hand up a frozen rope. Were we lost? Could our route be in this frozen corridor. I kicked another step, trying not to slide back down the gully. Ice covered the mossy walls and was slowly melting as the day warmed up. The sun had risen over an hour ago and the upper part of the Aeolian wall was baking in the morning sun. I stepped up and immediately fell through the icy crust up to my waist, a mix of snow and ice now filled the narrowing gully floor. I found a tree and a small boulder and kicked out a small platform so I would not loose my balance and tumble down the gully. Scanning the walls I found our route. A Uristoe bolt followed by a long string of shiny hangers lead up the wally through a large smear of ice to a high ledge. Lucasz now made his way up to my position; happy the mini cascades of snow and ice, I was causing, had stopped. The conditions were sub-optimal to say the least but the first pitch was mine and I hoped that if I could get up it using a bit of aid we would have a chance at the upper pitches, which should be in the sun and possibly free of snow and ice. Thoughts of the previous night echoed in my head as I racked for the first pitch. When Lukasz and I drove in from LA he remarked on how much snow was on the mountains. I dismissed this, thinking there was always snow in February and thought nothing of his observation. Now as my hands quickly went numb I wondered why I had been so naive. I clipped the first bolt and thought about the out plan. Inti Watana was long, around 8-12 pitches depending on linking, but mostly bolted and all under 5.10 except for the 2nd and the last pitches. This was to be a recovery climb since my left hand has been functioning at only about 50% of its capacity. I got the bolt clipped and was standing on good edges as I scraped ice off the rock with my nut tool. I found some decent holds and made my way above the bolt. Without the feeling in my fingers I resorted to aid and stepped on the first hanger but I was still unable reach the safety of the first shiny hanger. I was warm but my fingers were wet and cold and I couldn’t feel anything. I had to leave my stance on the bolt and move up through a slabby section on some wet edges to get the next bolt. After much hesitation I made the few move sequence and clipped in. 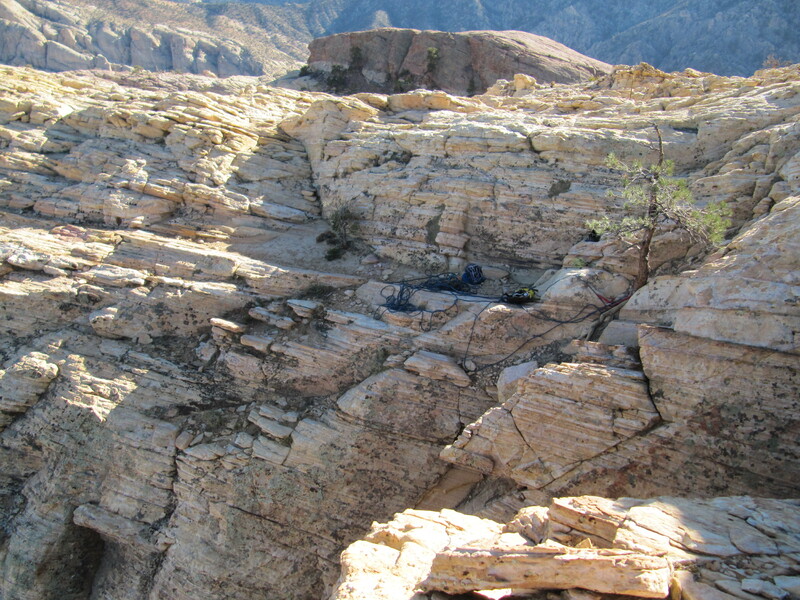 Just as the rope went into the quickdraw a loud echoing noise came from above that sounded like rock fall. Lukasz had been hit with small ice avalanches while I had been climbing but this we though this could be a big one. He hunkered down as I sucked into the wall as baseball sized climbs of ice rained down into the gully. We were both fine but decided to reconsider our alpine adventure. There are many other places to climb in Red Rocks and it would be silly to get hit with ice when we could be wearing t-shirts elsewhere. 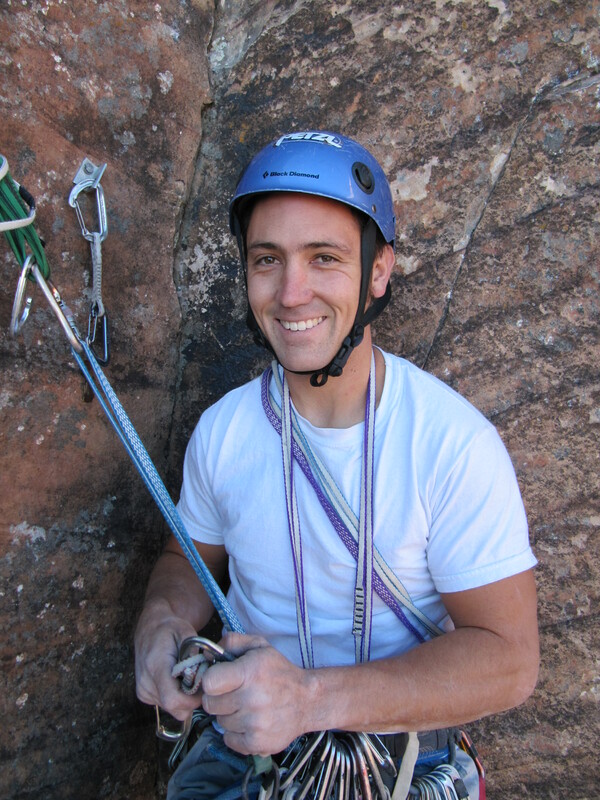 I left a biner and lowered off so we could pack up our gear and do some climbing. Before leaving we got hit with an even bigger ice fall that validated our choice. Back at the car by 10:30 we had taken a bit less than 2 hours each way hiking. 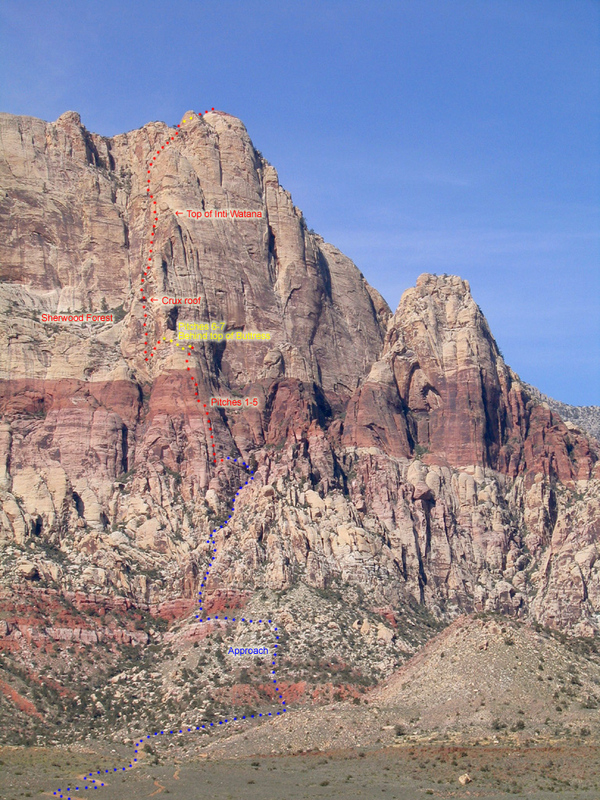 The majority of the approach is on the main fire road with a mandatory scramble up a gully on the way in. This is the 2nd gully you pass and is aptly named the white rot gully. It is a steep, narrow and sandy passage (of white sandstone) that ends with a bit of tunneled under and then over a large chockstone. We descended via the main Aeolian gully and rapped the final bit with a 70m rope which just reached. To avoid the rap you must do a mandatory 5th class down climb which looked bad and was wet. For reference we could have easily gone back down the white rot gully (how we approached) with 3rd and 4th class scrambling but I wanted to check out the rappel option. We spent the rest of the weekend clipping bolts and enjoying warm February weather despite our out of place encounter with snow on Mt. Wilson. I should have realized that the north east facing Aeolian wall would be cold and could still be holding snow. Despite my injured fingers I stubbornly tried a bunch of routes that ended up making things worse. 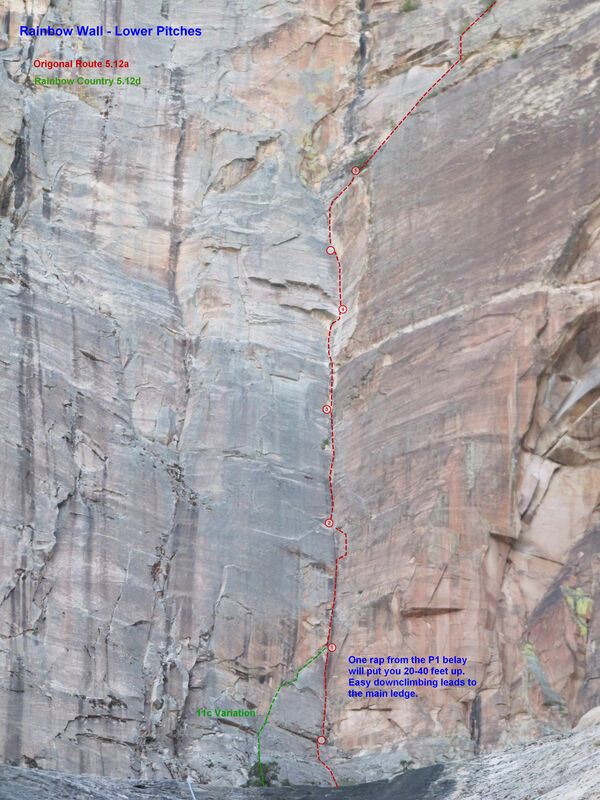 I manged a few fun onsights at the sweet pain wall and Lukasz redpointed the namesake route. We also spent some time at the gallery where I momentarily dabbled on Fear and Loathing before turning the sharp end to Lukasz for a 3rd try send !!! (6 or so overall). 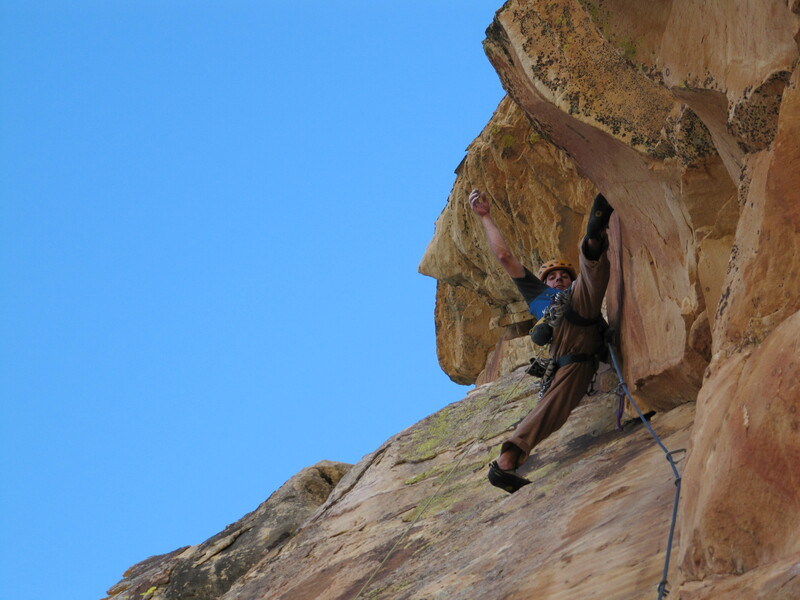 He crushed the route and made me wish that I could crimp again with my left hand. Overall I had a really fun weekend despite staying mainly at the Second Pullout. 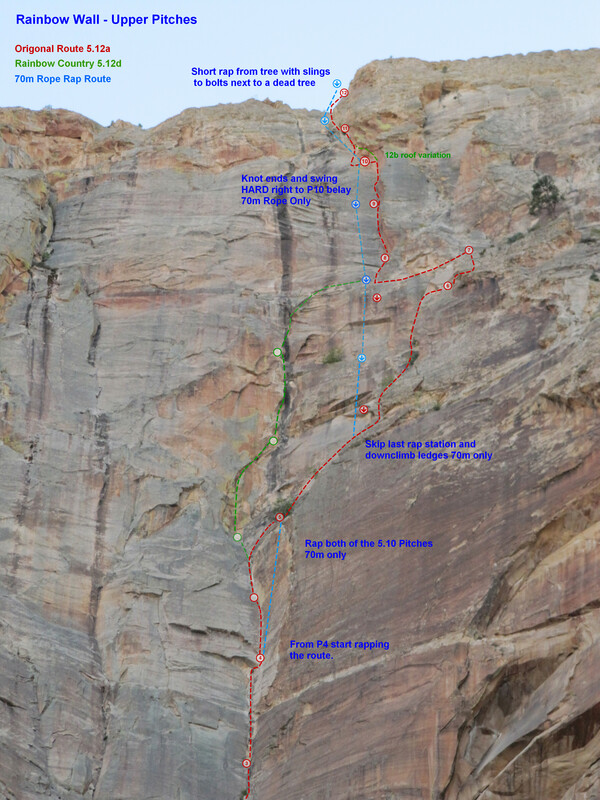 We climbed at the Sweet Pain wall,the Tsunami wall, checked out California 12a, which was wicked steep, went to the Gallery and the Wall of Confusion. 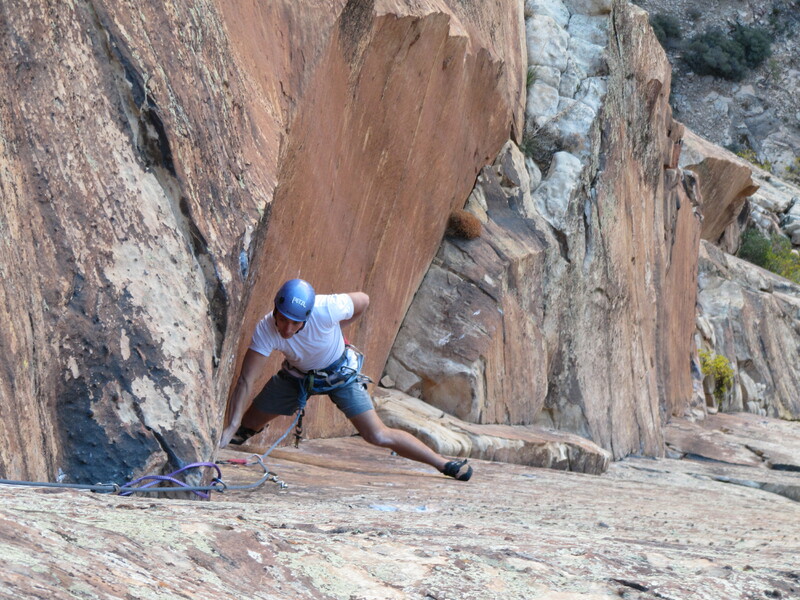 This was only my third time or so solely sport climbing at Red Rocks despite many visits over the last 3 years. 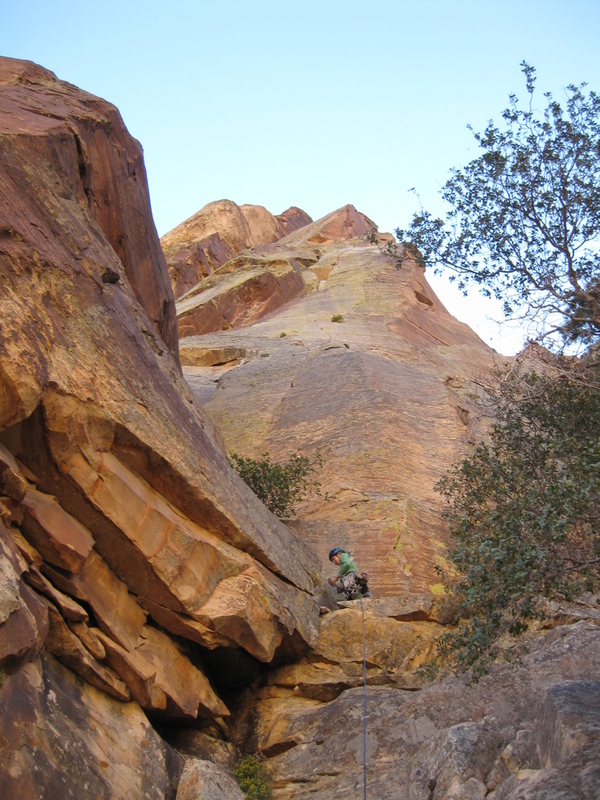 I really prefer the longer routes in Red Rocks and look forward to some warmer weather where you can climb in the shade. 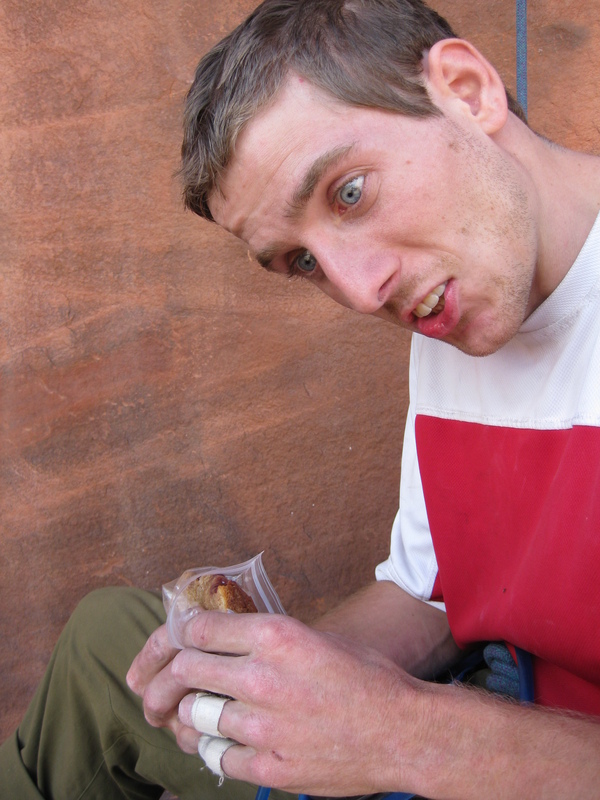 Regardless the sport routes are well worth it and are fingery and pumpy though not always on the best rock. I guess I am just spoiled after climbing on the East Coast in places like Rumney, the New River Gorge and the Red River Gorge as well as the Obed in Tennesse. This past weekend the weather was perfect and we had an amazing couple of days in Red Rocks. There were a staggering eight of the San Diego crew out at the Gallery on Saturday so Lizzy and I were able to take a bunch of Photos. Sunday Lizzy and I opted for some solitude and had a fun time at the Stone wall. While the rock is a bit soft the routes are longer and we enjoyed being alone while we were there. Sonia on the super crimpy Minstral in the Gallery. 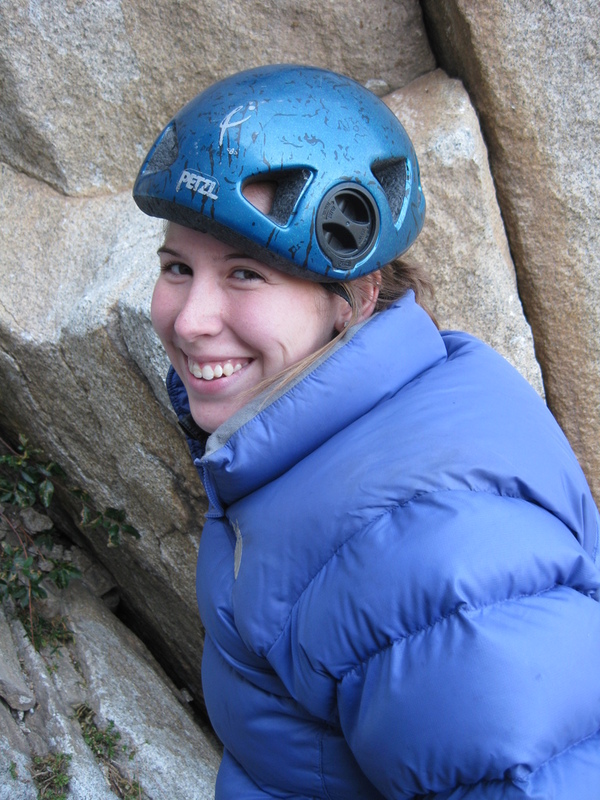 “Nervous?” Lizzy asked at the belay below the crux pitch. A whirl of thoughts flew through my head. I was distanced from my objective, an onsight of cloud tower, and was not feeling the stress. A little less that a year earlier Lizzy and I had climbed Levitation 29. 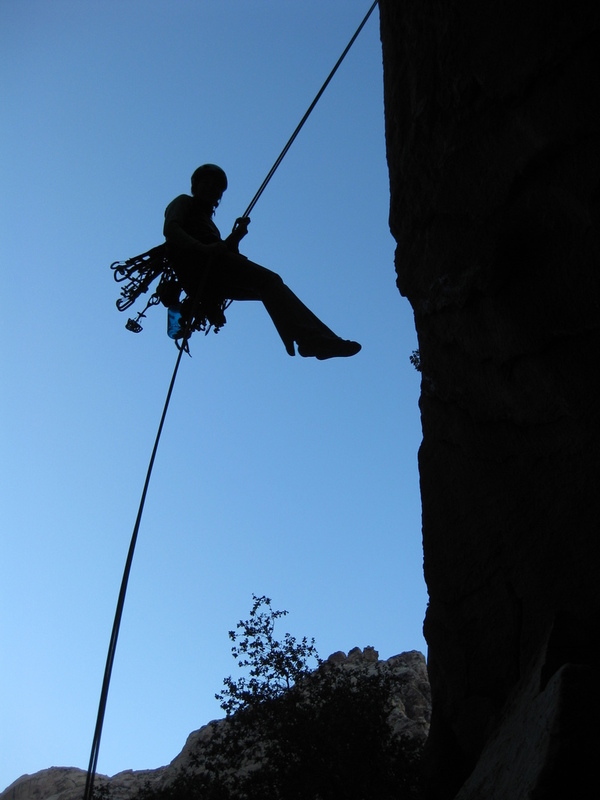 On that route I had struggled with a fear of failure and had not given the climb my full commitment. 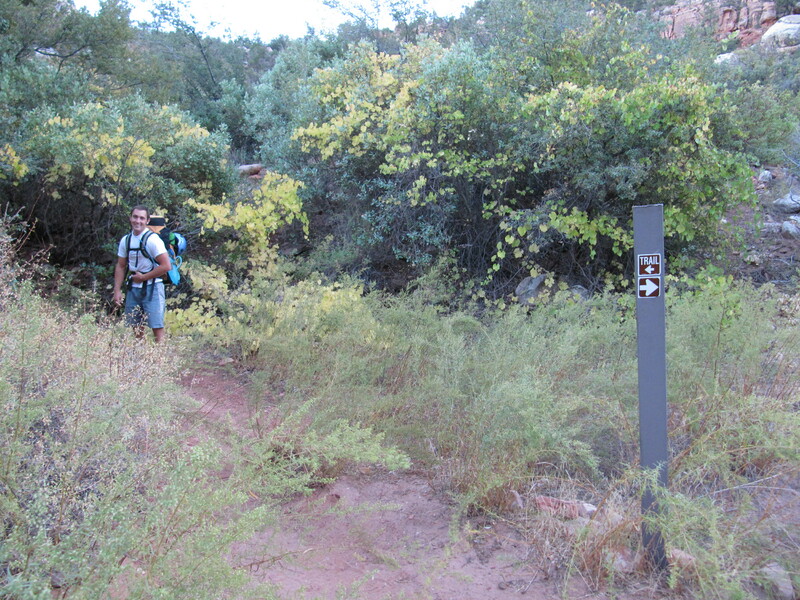 While I was still able to do the route onsight I hesitated often and didn’t enjoy the experience as much as I had hoped. This year I was more detached from success and put everything on the line. Staring up at the thin dihedral I was not afraid and was up for a challenge. After a funky start with some face moves and a couple of bolts (which should be replaced) you reach the base of the crux corner. The left wall overhangs slightly and the crack is THIN. I got a small nut in to back up the old bolt and used some face holds to get up a bit higher. A blue alien later I was standing on some good footholds. 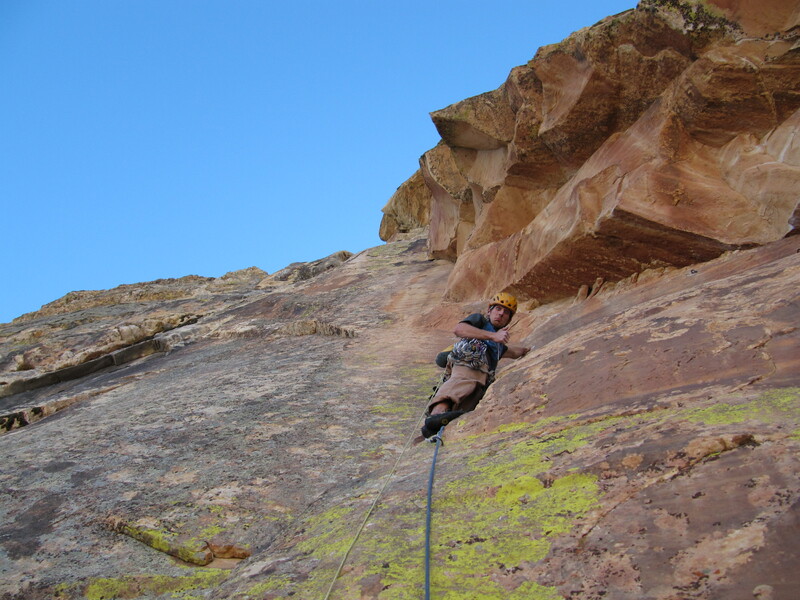 I worked my way up the face holds and found a good slot and was able to clip a fixed nut in the main crack. I made my way back onto the face and got a bomber Green (#0) C3. 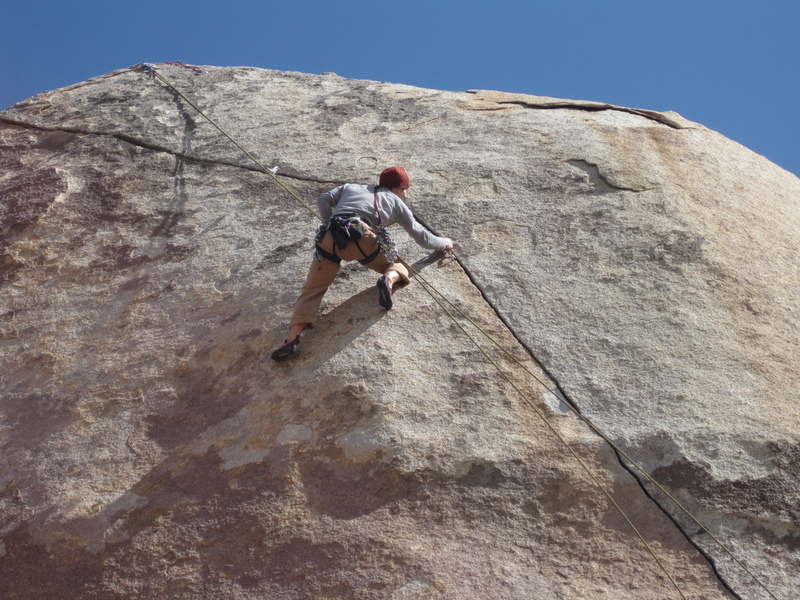 So far the moves had been hard to sequence and I was amazed to still be climbing. The crack was getting wider but far from my finger size. I could see a good jug on the left wall and made some tenuous stems to get there. Resting on this jug with an ok foot I was able to get in a bomber blue master cam (these are slightly smaller than the green alien which helped). 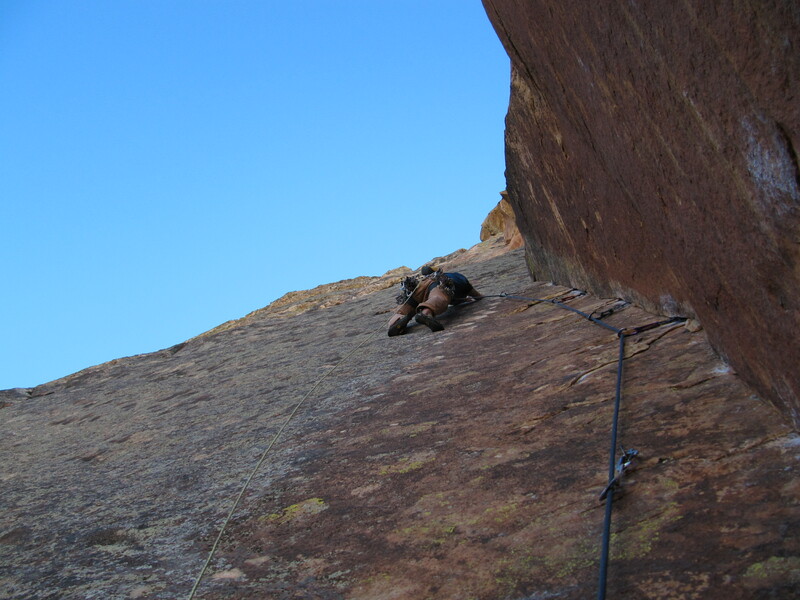 After hanging out on the jug I knew I had to get going, the crux was the next 40 feet and I would have to go all out. I stemmed up got in a green alien and started making the hardest moves thus far. Making long reaches between small pods I was laybacking up the crack, fingers barely fitting. I gained an ok foot and a made quick green alien placement. Pulling as hard as I could I made it a bit higher and was able to get a good stem and a bit of a rest. I was pumped and shoved in my last green alien, wishing I had a blue tcu or master cam since the slot was a bit small. There were no more feet in the next section but I knew the crack was getting larger. I crimped and finger locked my way up the crack and after 10 feet got a bomber lock. Two more pieces went in and I kept going for the ledge below the belay. Pulling into the alcove I had made it!! A couple more quick placements including the suggested #3 Blue Camalot and I was on the anchor ledge. 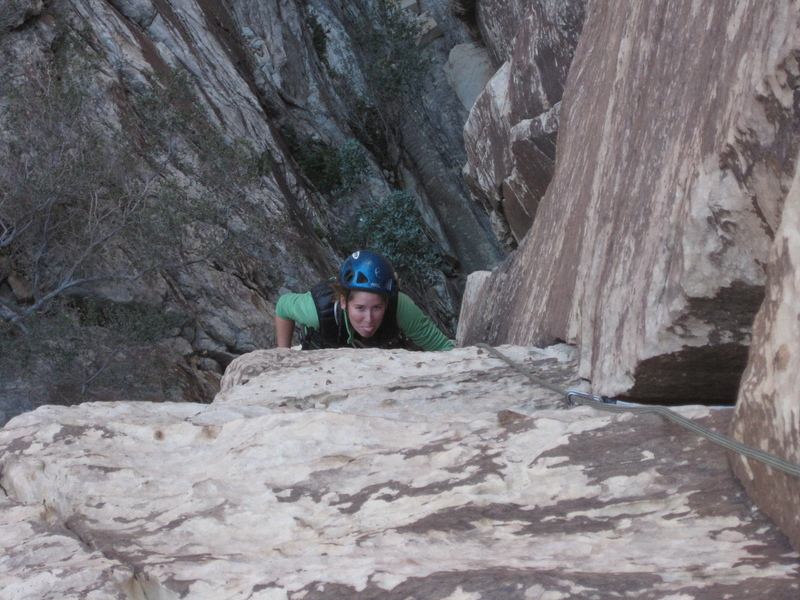 Lizzy following the crux thin corner. This past weekend Lizzy and I were out in Red Rocks. An early Friday morning departure from Pasadena allowed us to climb Friday night. With the parking lot at Black Velvet now open we could access BV Canyon via the standard road. While the road is pretty rough it does not require 4WD which was shown by the two PT Cruisers we saw, I still think it is advisable to have good clearance. 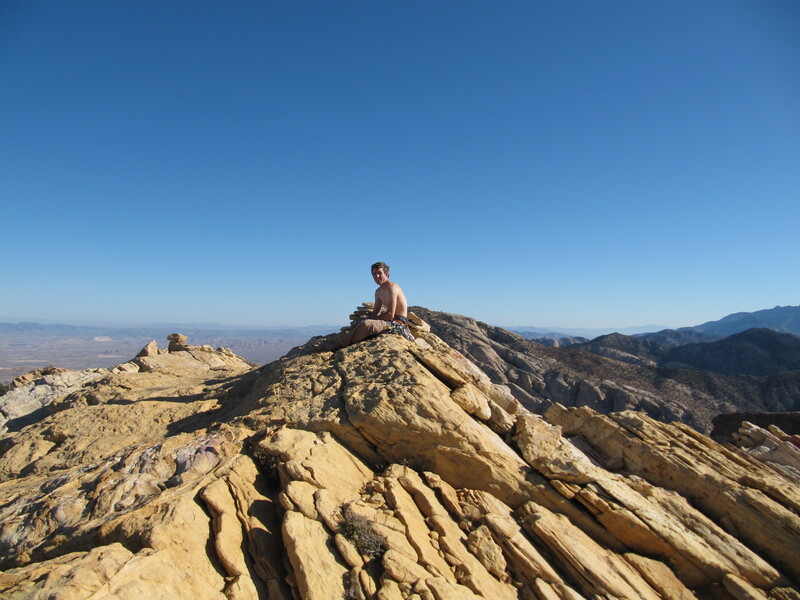 Our climb was on Whiskey Peak so we approached to Frogland and traversed across the base. This approach gave us a good overview of the climbs in the area since Lizzy and I had not been to Whiskey Peak before. While simple, the approach was a bit on the longer side and it was mid afternoon by the time we got to the base. Only The Good Die Young starts in a gully on the far right side of Whiskey Peak. Even though the line can be seen from the Black Velvet Wall I doubt people realize it is there. 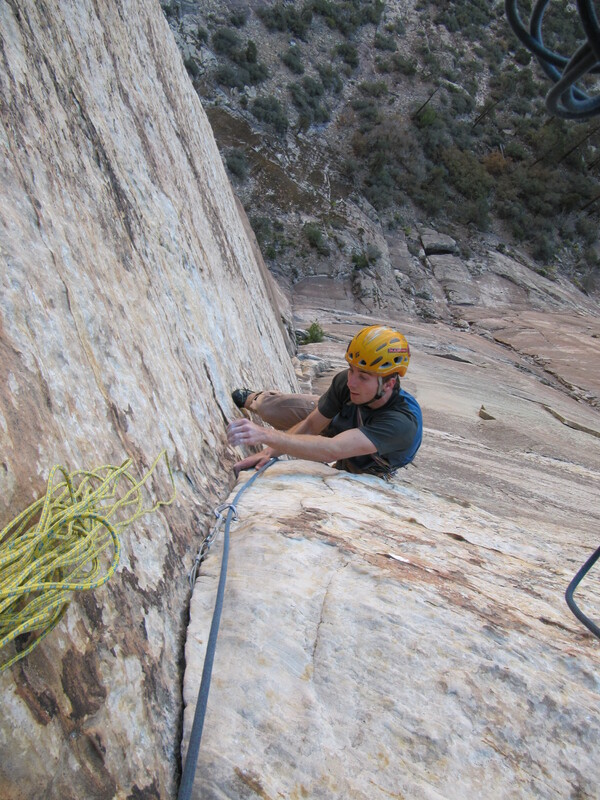 The climb is 5 super short (50 – 75 feet) pitches with closely bolted cruxes. The idea was to a bit of a tune up and get ready for Cloud Tower on Saturday. I linked the first two pitches by using long slings and running it out a bunch. 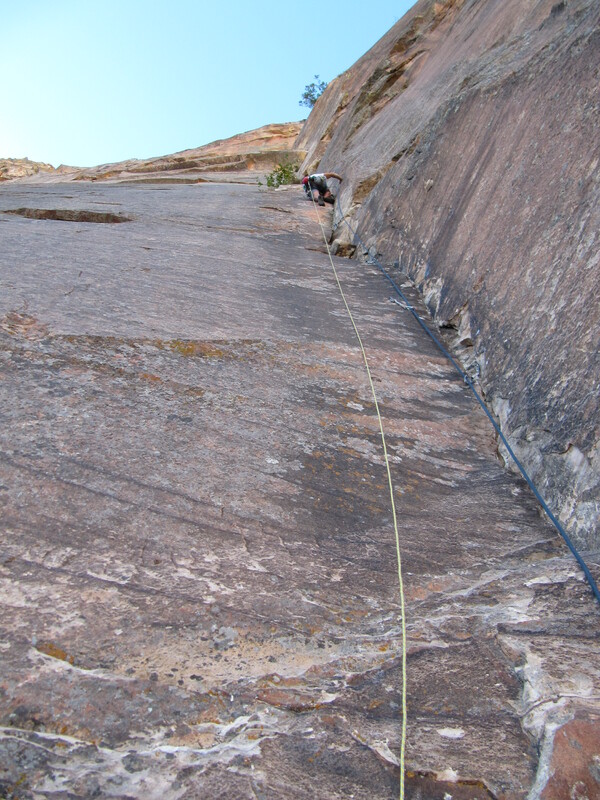 The first crux was sustained small hold pulling past 5 bolts with bad feet. Lizzy and I both found this section hard but neither of us fell. 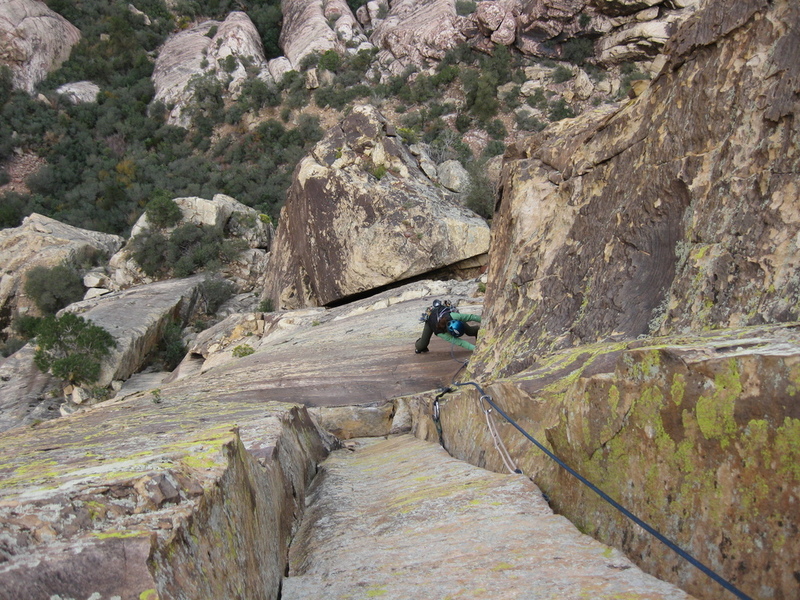 The slabby ramp of P3 set us up for the crux traverse. 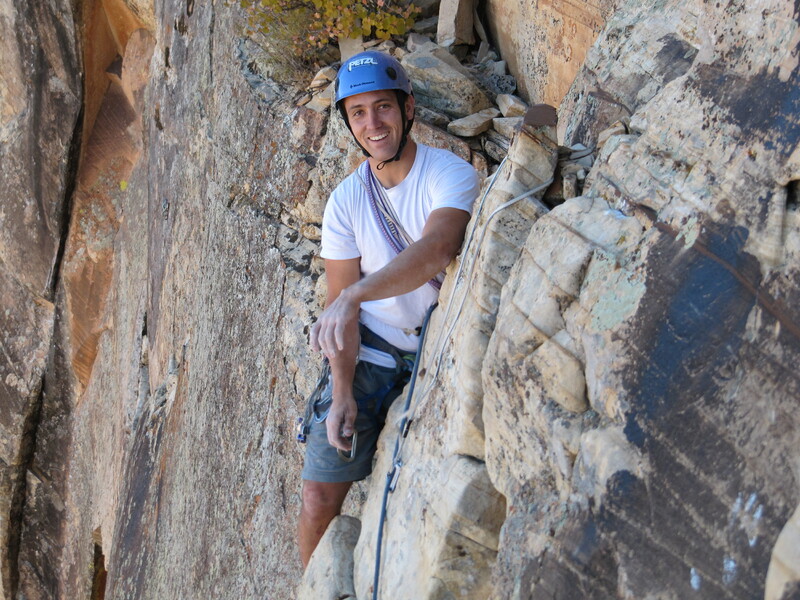 The rock on this slab was a bit hollow and I was happy to have bolts protecting the fun crux. The rock was at such a low angle that the tiny holds felt usable. Staring up at the crux I couldn’t see the holds. After a bit of a rest I set off and made my way up to the crux move. From a good left hand undercling you were supposed to get established on small crimps and then move right to some bigger crimps. I was only able to hold on one crimp with my right hand and could not make room for my left. 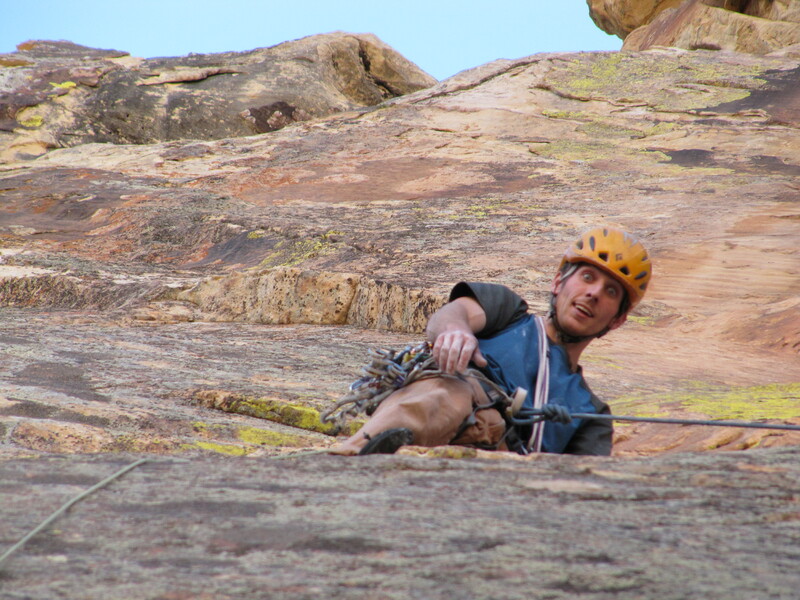 I spent about 5 minutes trying things out and then carefully downclimbed the 10 feet back to the belay. I was stuck and couldn’t figure out how to get my left hand onto the one hold. I went back up and spent another 5 minutes trying to figure it out but to no avail. I gave up on a match or a hand switch and decided I had to make a reachy cross to the next hold. I got established in a stem, grabbed the right crimp and turned my body as far as a I could and just made it to the next left hand hold! I quickly clipped the next bolt and made my way across to a large jug. The following section was quite exciting as you moved across this large rail with insignificant feet. There was even a fun clip where you had to reach below you to clip the bolt. The holds were large and I made my way to the end and pulled up and around the corner. 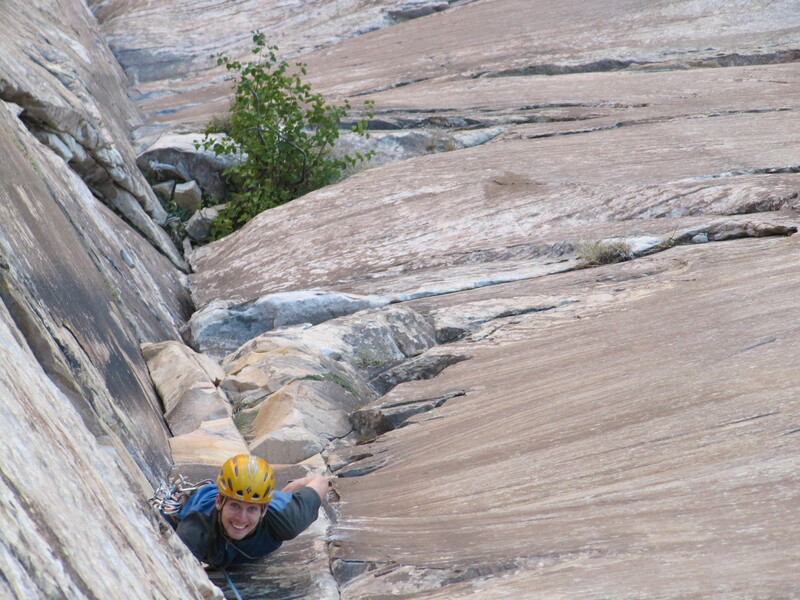 With a long runner on the first bolt and I made my way through two more bolts of thin slab to gain a ledge. 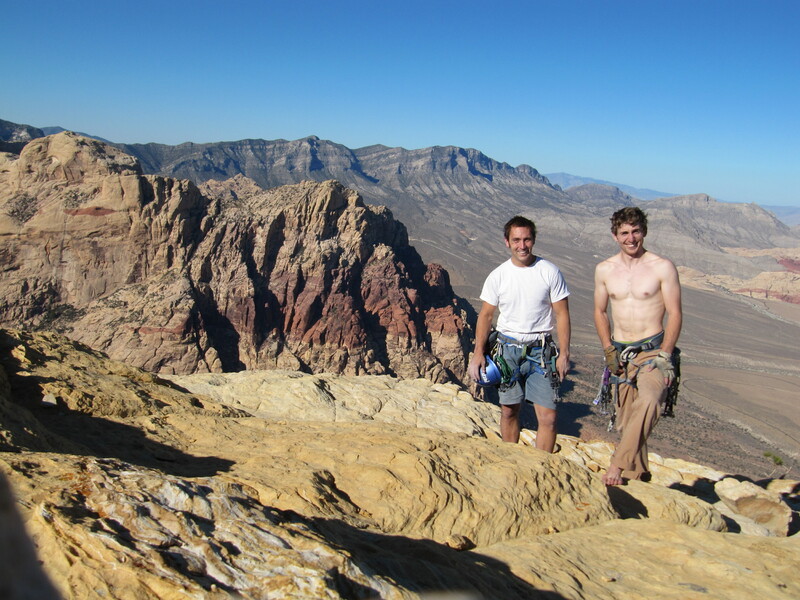 The rock was quite rotten and did not inspire me to stop so I kept going and belayed much higher at a notch. Lizzy followed the pitch clean, using a bit of A0 to clean a draw, and was able to match the crimps at the start and make the reach with your right hand. 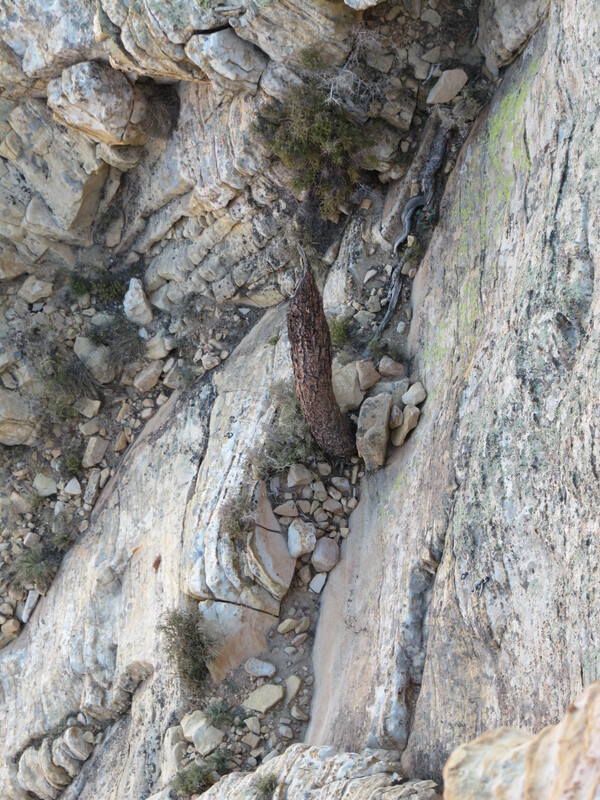 After reaching my belay Lizzy set off across some 4 class ledges and after a rope length we switched and I led across and down to our rappel tree. Lizzy rapping down into the gulley. A short rap and we were in the gully on our way down. The gully split and we took the easier left branch which did not lead directly to the base of the route. It seemed a bit easier but required us to traverse right at a big cairn, which might have just been 2 random rocks on a big ledge, and make our way over to our packs. A more direct hike down to the wash saved us some time going back to the car but we still finished the hike in the dark. Saturday morning we got going a bit after 7am and drove into the loop road and called in a Late Exit Pass. 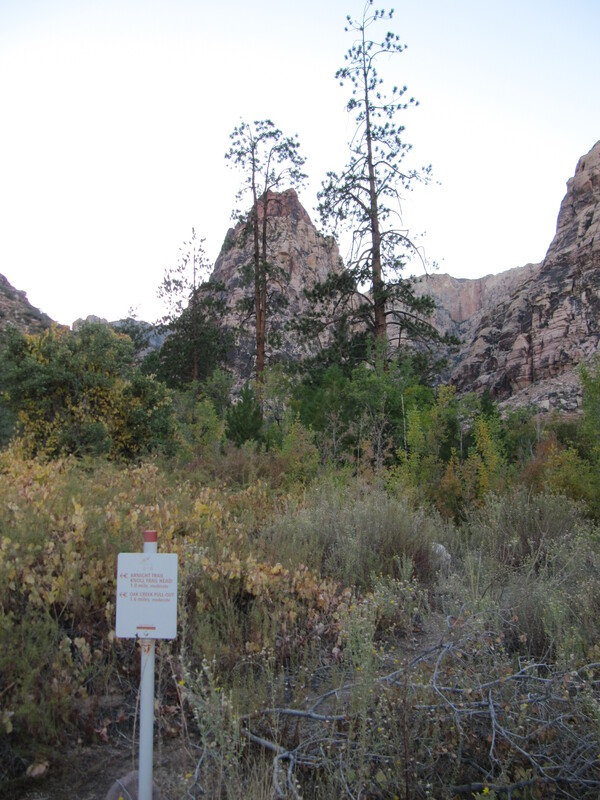 The hike to Cloud Tower starts at the Pine Creek Canyon parking lot and traverses on some good trails towards Juniper Canyon before going up a large hill to the base of Cloud Tower. A few false turns and we were trudging up the hill towards our route and Crimson Chrysalis. When we reached the base there were many parties on this classic 5.8, one on route, one just leaving the ground and one patiently waiting. We made our way past this mess to the empty Cloud Tower. Lizzy starting out on the 3rd pitch of Cloud Tower. Lizzy lead the first 2 pitches which we kept separate due to a lack of gear. I was carrying a few extra cams in our pack so Lizzy was a bit short on hand sized pieces, which I thought were only necessary for the last pitch. Having the full rack and a few runners would allow you to link these two pitches. We brought the following gear: #00 C3, #0 C3, 2 Blue aliens, 1 Blue Master Cam, 3 Green Aliens, 2 Yellow aliens, 2 Grey aliens, Red alien, #.5 C4 , 2 #.75 C4, 2 #1 C4, 4 #2 C4, 2 #3 C4, 1 #4 C4. Even with this massive rack we could have used more. At a minimum you NEED a second #4 C4 for pitch 5. I would also suggest another #1 and #3. Having another #2 would allow you to really sew up the last pitch. On the Crux pitch as I said previously I would rather have had 2 green aliens and 2 blue tcu/master cams. I did not use the #00 C3 but there were places on P4 it would have fit. Lizzy in the middle of the hand crack on the 3rd Pitch. 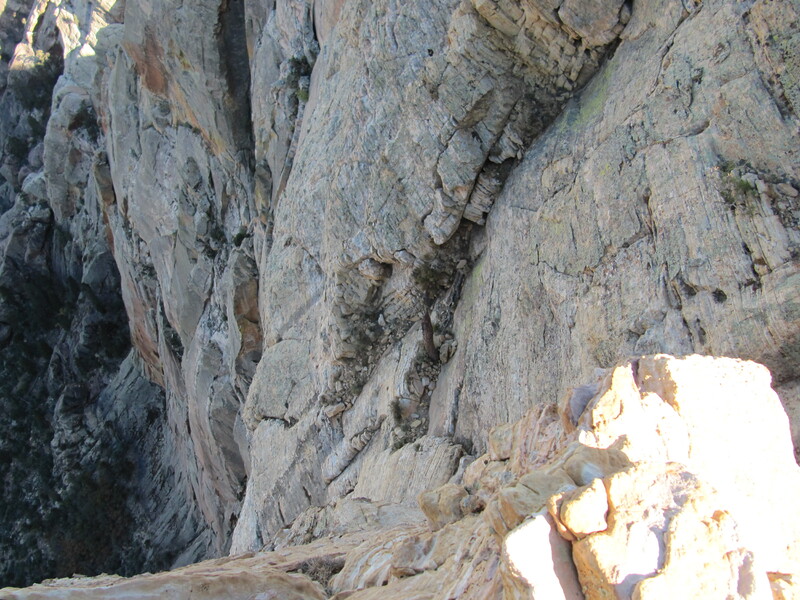 The wide 5th pitch can been seen above the crux dihedral. 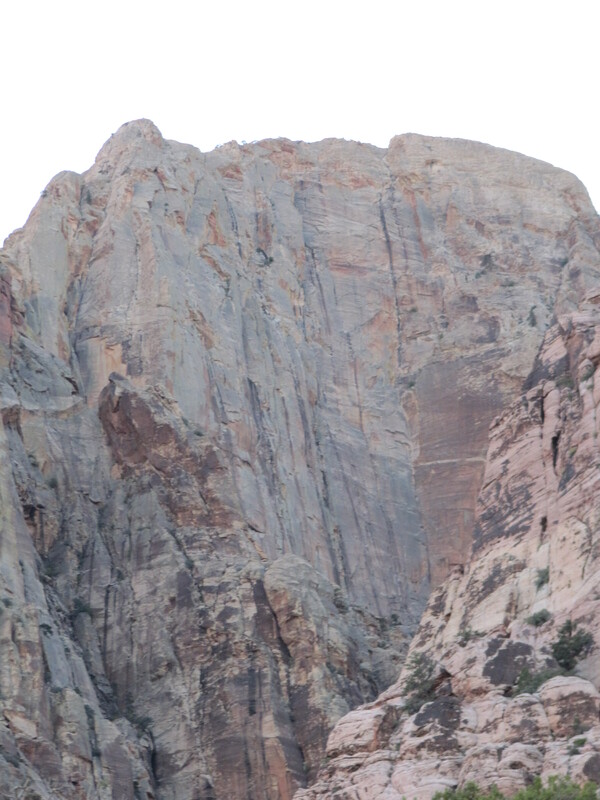 After the first two funky pitches Lizzy lead off on the 3rd pitch, a sweet hand crack followed by a face traverse to the belay below the crux dihedral. Lizzy styled this pitch and made it look easy. 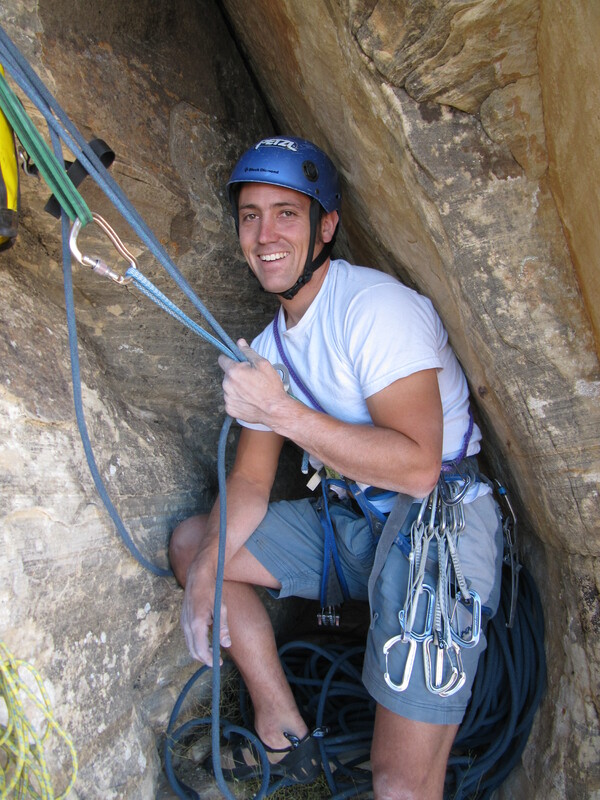 After reaching the belay I went about swapping the gear. All the large gear save a #3 went into the pack and the trail line came out so that I could haul the pack for Lizzy. The pitch was awesome and I was happy to have gotten the onsight. 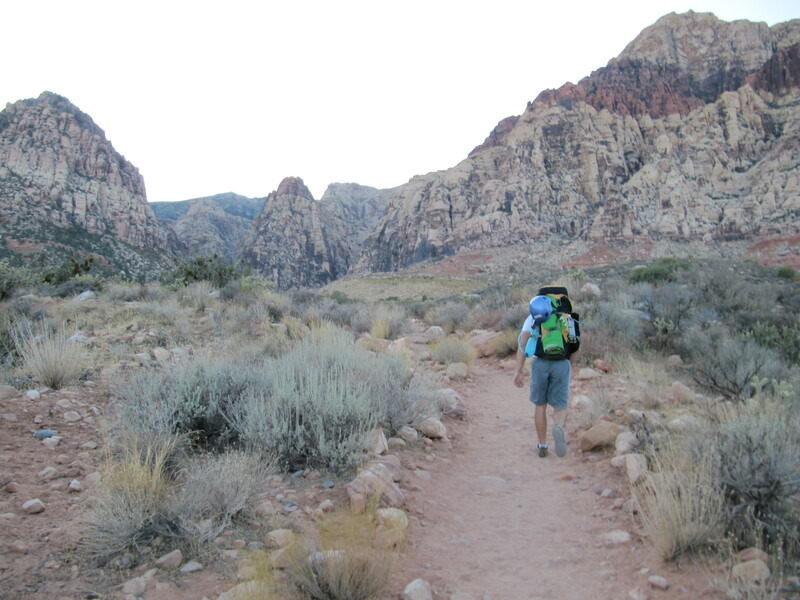 I hauled our pack on the trail line, using a DMM Revolver for a pulley and Lizzy got ready to follow the pitch. 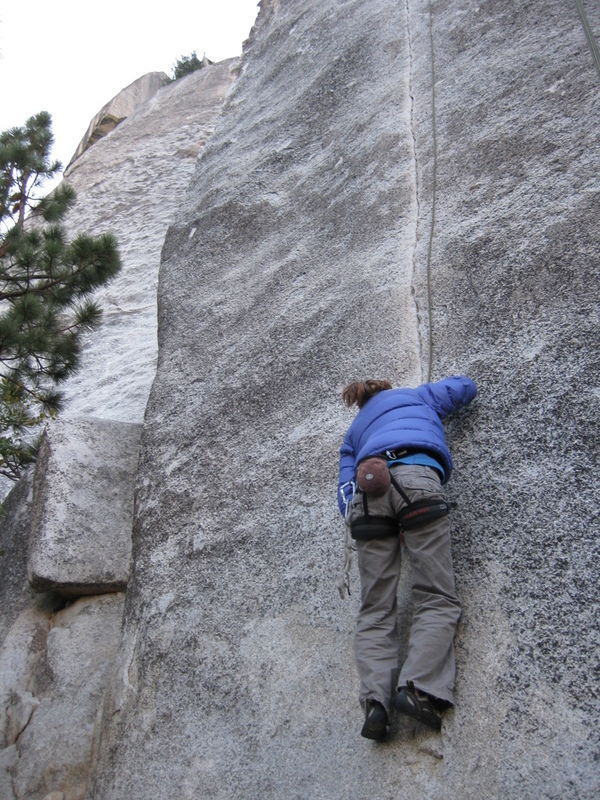 She climbed without hesitation and fell only a few times due to the pumpy nature of the pitch. With her little fingers she was able to avoid the face holds that I had found quite necessary. 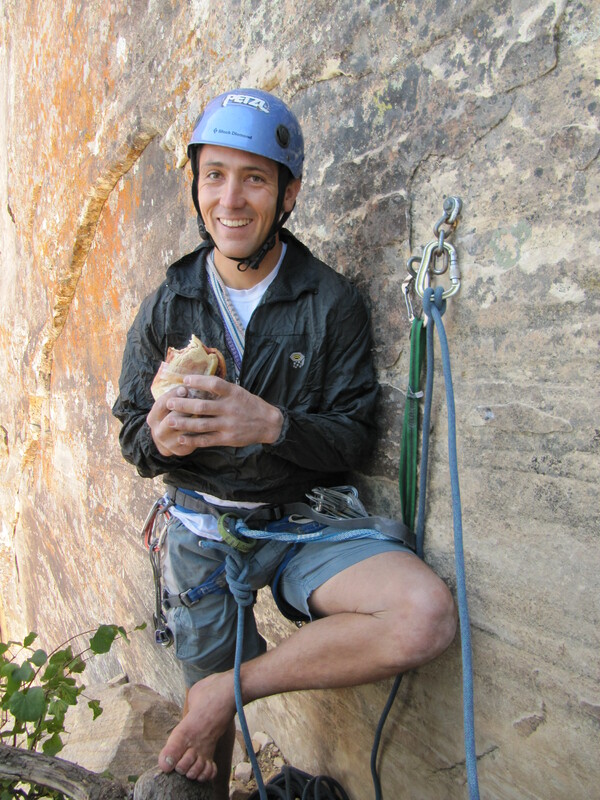 Happy to have the hardest pitch behind us we had lunch in the little alcove before continuing on. 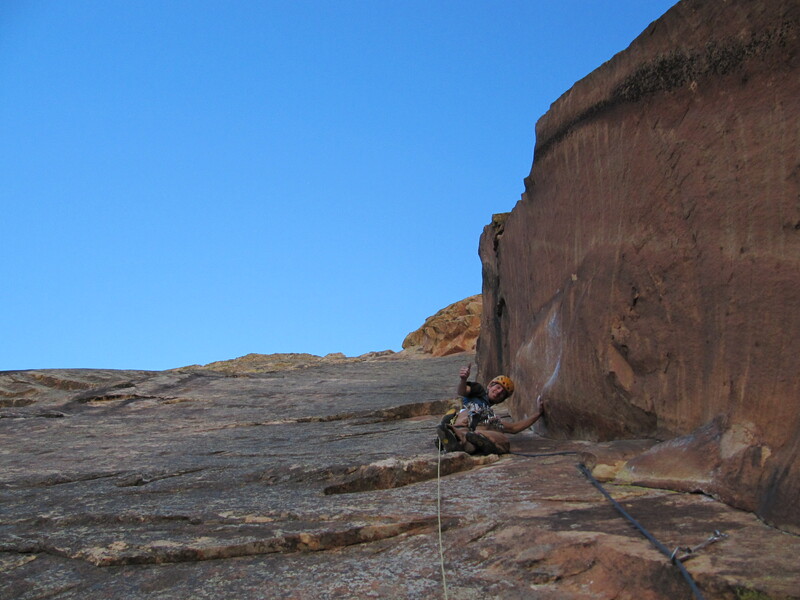 The next pitch started with a fun hand crack through a roof and gradually became wider as you got higher. I stubbornly had only brought two #3’s and one #4 and had to do a bunch of runouts and leap-frogging and backcleaning my cams. At one point the crack became too big for my #4, luckily the climbing was not too hard (10-). 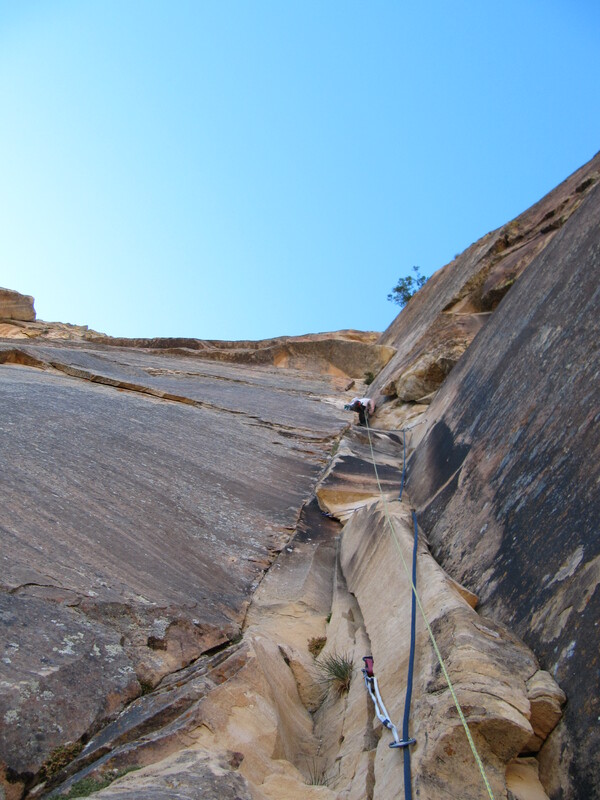 Shortly I was able to get some 1″ gear in a hidden crack that helped my lead head after the 30+ foot runouts. I found one final placement, where you could belay, to the left of the crack before tunneling through to the other side. 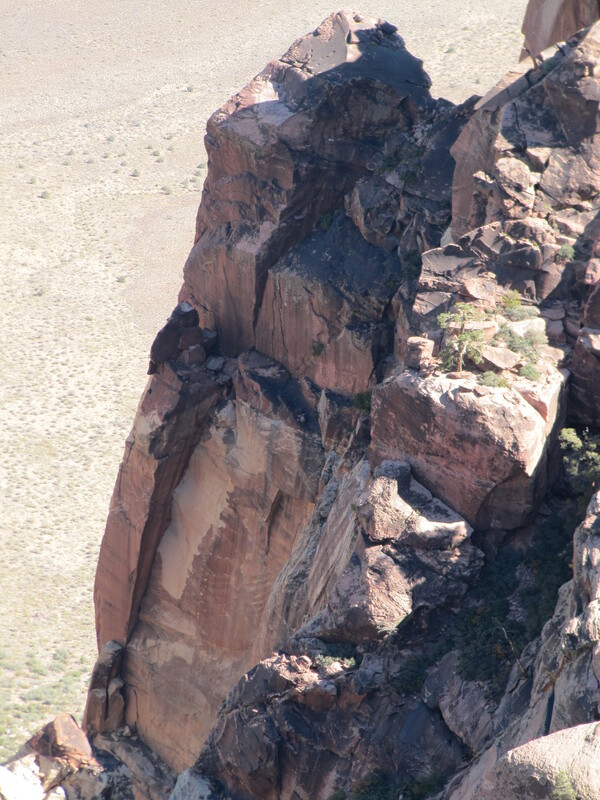 The chimney was easy and while you were a bit runout from your gear you would not fall. Even if you fell you would just get stuck inside the crack. I belayed below the final splitter and used a high cam to protect Lizzy on the final moves. Lizzy laybacked much of the wide pitch and after shuttling the pack to me made it across the chimney. Lizzy pulls up into the good rest after the thin dihedral. We were both tired and were running low on water. After the last pitch I was nervous about having enough gear for the final pitch. I aggressively back cleaned as I led and wasted a lot of energy placing, removeing, clipping and unclipping my cams. About half way up I was exhausted and hoped that I had enough gear to finish. In fact I though the bulge I was climbing up was the end. With the motivation that I could be finished I pushed hard only to find out there was still more climbing. 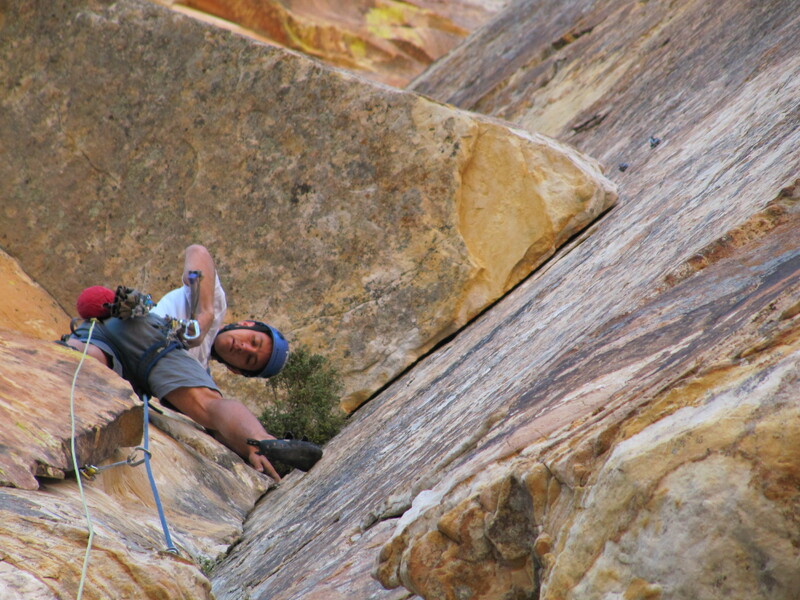 Luckily there was a no hands rest before the final crux bulge. I still had some gear and had to try for the onsight. The climbing was steep but the holds were good. I placed gear quickly, sure that I would fall at any moment. At one point after placing a high cam. I was unable to pull up the rope to clip. It took me three tries alternating between hands before I got the rope in. Luckily some foot holds appeared on the left wall and I was able to get in some more gear. “I may fall at any moment” I yelled to Lizzy from the final bulge. I was so pumped and the steep climbing was getting the better of me. One last cam and I was at the top of the bulge. I was jamming my feet into the crack and had my hand in the wrong position for the reach over the top. I switched to a different jam, almost slipping out of the crack. From this new position I was able to reach a good fingerlock over the lip. With no technique left I pulled as hard as I could, flopping my feet over the bulge. I grabbed the next jug and pulled myself onto my feet. I was almost dry heaving I was so tired. 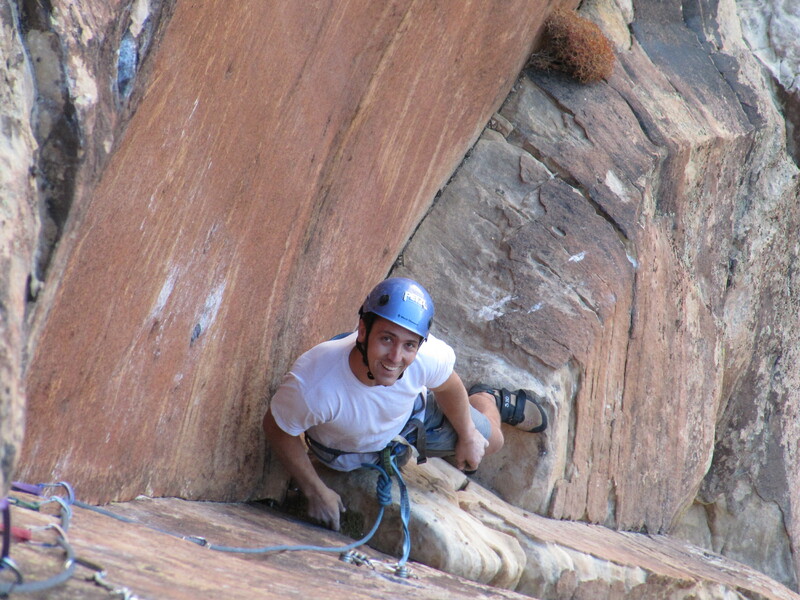 The experience reminded me of thruching up an offwidth in Indian Creek. My core was so sore and my arms were rubber, but I was done! I tied into the five crappy bolts and pulled up the rope to belay Lizzy. 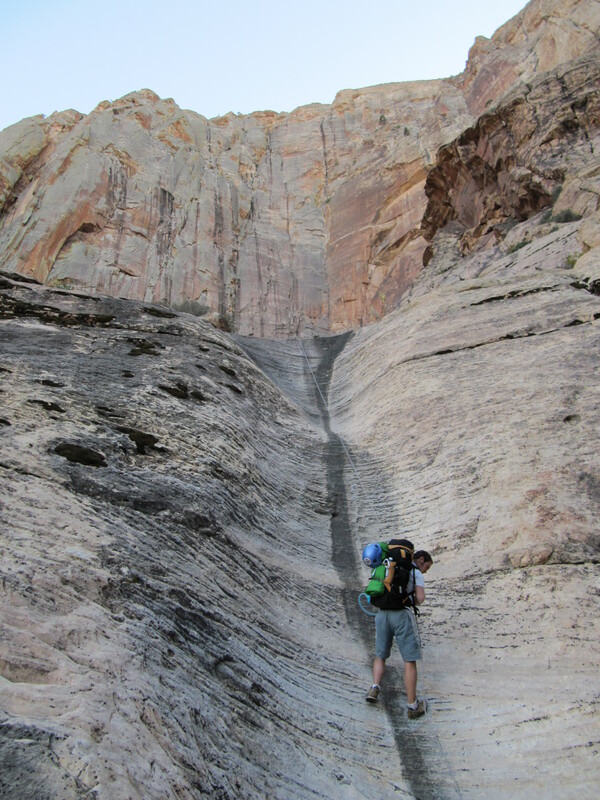 She lowered the back pack to the ledge below and climbed up with the trail line. The crack was all the wrong size for her but she still made it in only a few falls. We were happy to have finished Cloud Tower but were both thrashed by the final pitch. Its steep and powerful nature was a hard blow at the end of the day. We quickly rapped off, drinking the rest of the water before reaching the ground. 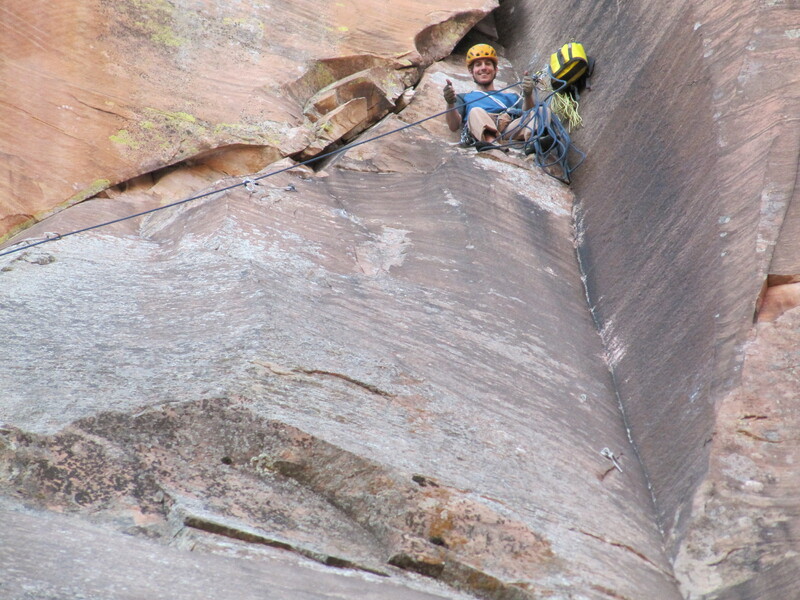 On the final rappel, after walking across a big ledge, we got our rope stuck. The suggested rap route, down the first two pitches, didn’t look so good but it was getting dark and I was worried that an alternate route migh risk a big swing or cause rock fall. We ended up getting the rope stuck, with the knot connecting the ropes securely wedged in a crack. 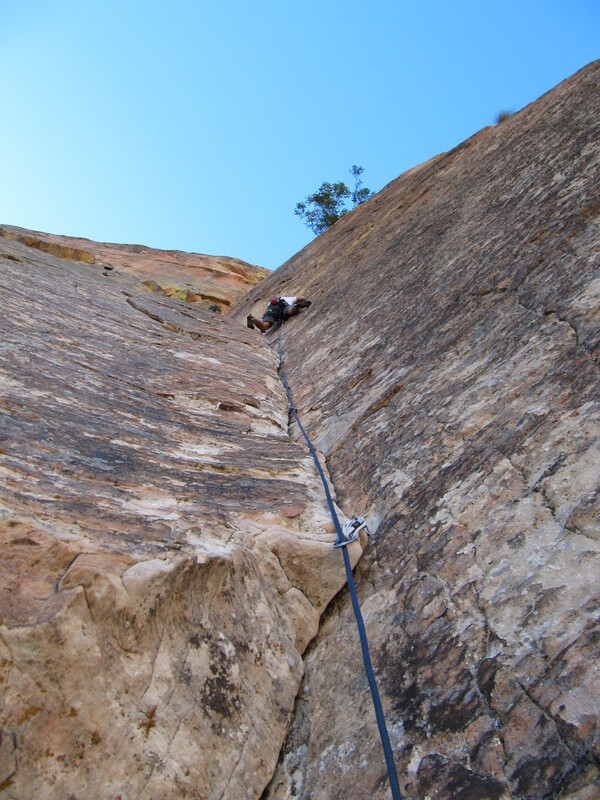 Luckily we could still reach the ends of the rope so I reclimbed the pitches self belayed by my Shunt. Even though it was quite dark the climbing was relaxing after the hard pitches and I was having fun despite having stuck the ropes. I made my way up to the stuck knot and adjusted the ropes so the knot was below the constriction. I rapped down to the midway station and pulled the ropes. I got our new Ion down without a problem but when it came time to pull the trail line I had no hope. I pulled as hard as I could but to no avail. I was now feeling the effects of a long day and didn’t want to have to relead the pitch and potentially get the rope stuck again. I had Lizzy tie my knife to the end of the trail line which barely reached the ground. My though was to cut the majority of the trail line and rap with the 70m rope. When I tried to pull up the knife it got stuck in a crack; honestly you can’t make this stuff up! I was done, I was no longer having fun and was now accepting that we had lost the rope. I coiled our lead line and attached the trail line to the quick link on the mid anchor. I single rope rapped the trail line and was able to free my knife and make my way to the ground. In retrospect we could have re-climbed and then downclimbed the first 2 pitches but it was late and we were pretty tired and a bit dehydrated. Leaving the rope was a small sacrifice to be safe so we left it. The hike out proved fast because we were going downhill. We made it back to the car in 1 hour and 15 minutes, almost a half an hour faster than we approached. With no ticket on the car we headed into town for some fast easy food and went quickly to bed. It took a little over 11 hours car to car. Tired from all of the hiking and climbing from the previous two days we decided to do a bit of sport climbing. It was hot and the Black Corridor seemed like a good destination. Moderate sport routes were our speed. After leading a few routes Lizzy was feeling the effects of the hard climbing of the previous two days and deferred to belay duty. I sampled as many of the climbs as I could manage. The two sides of the corridor are vastly different. One side is steep with deep huecos and jugs everywhere. You can easily crawl inside to rest or get a variety of knee bars. The other wall was devoid of large features and was slabby with small incut holds. The climbing was interesting and the rock quality was a bit lacking. I managed to do 9 routes up to 10d in the 4 hours that we were there. We were tired from a long weekend and by 3:30 were ready to go home. A bit of Starbucks later we hit the road and made good time to Primm. Whenever Lizzy drives she tends to summon wind or traffic. For some reason the setting sun was a bit too bright and brought traffic to a stop going up the big hill just after the California border. We sped up for a while before hitting a major traffic jam before the Agricultural inspection station. We lost more than an hour to traffic and made it home around 10pm with a Baja Fresh stop for dinner. It was great to get back to Red Rocks and I look forward to future trips! The fall has quickly come and its gaining momentum faster that we can imagine. The stacks of three day climbing weekends have been amazing and this blog has surely been neglected. I have to pack all my work in to a four day week and then we are off on some crazy adventure every weekend. 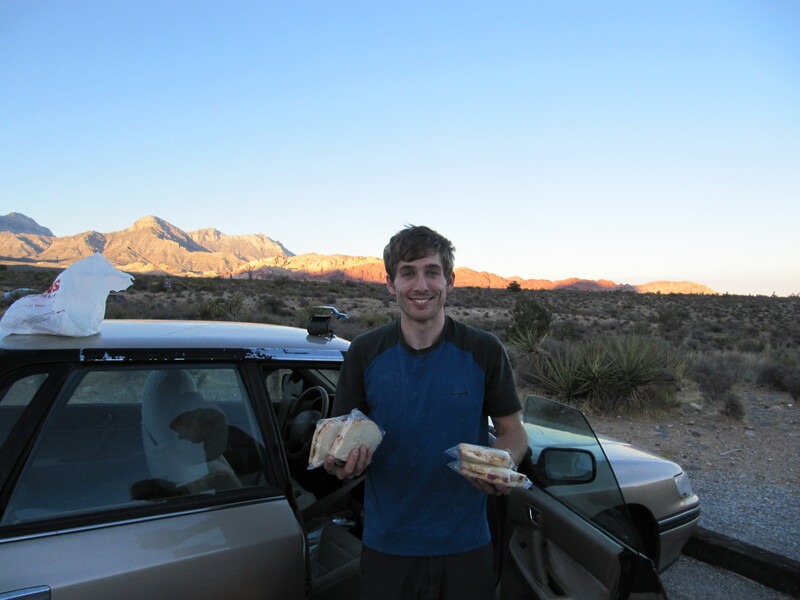 I got a email from one of my cousins a few weeks back so we meet them out in Joshua Tree for some camping. While Lizzy and I were nervous for desert heat we experienced quite the opposite. All of California got hit with a cold front and it was beyond chilly. 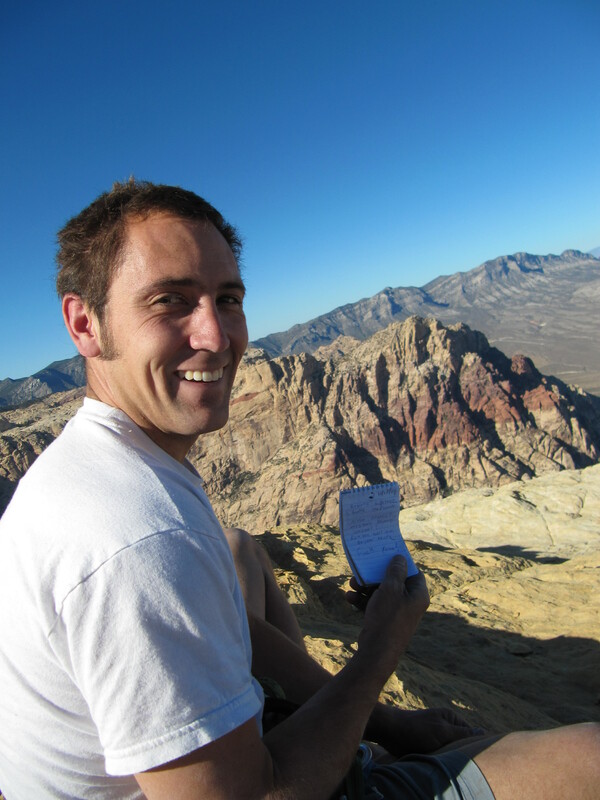 At the Owens River Gorge, the week before, I was wearing shorts and a T-shirt climbing in the shade. 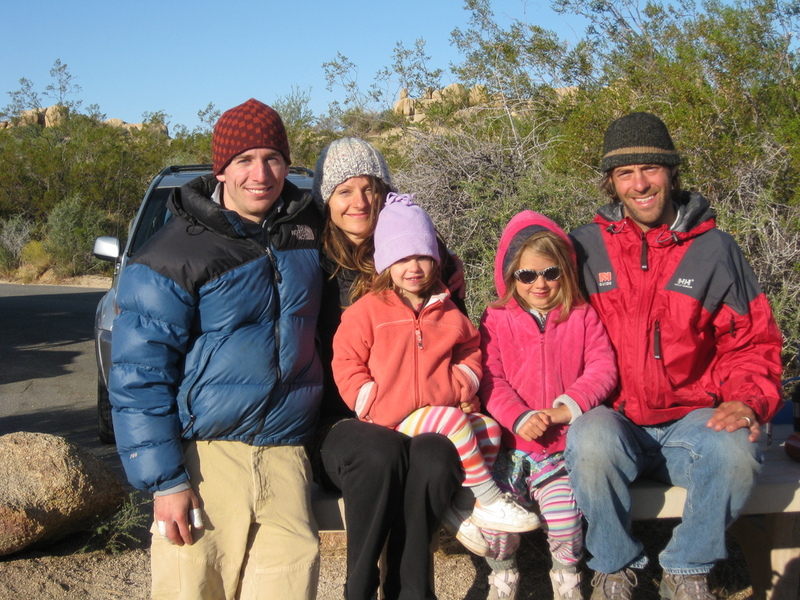 In Joshua Tree we were wearing down jackets in the sun and were still quite cold. This storm signaled the start of the Santa Ana winds which were blowing hard on my drive down to San Diego the following Monday. 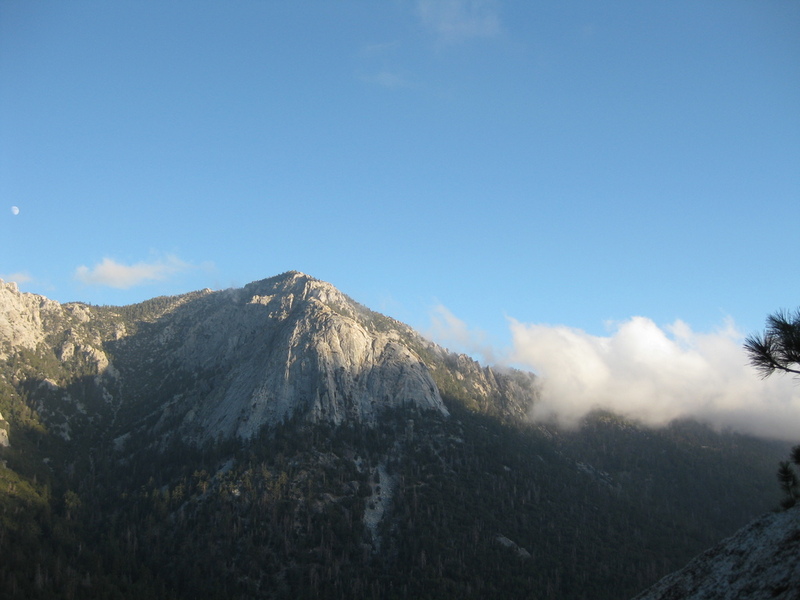 We saw some crazy clouds in Idyllwild on Friday and were chilled by the wind on Saturday and Sunday in Joshua Tree. Our friends Julie and Josh even got some snow in Bishop. Returning to our cities has not provided much respite. San Diego is a bit chilly and parts of the LA area are on fire, fueled by the wind. Lizzy did a good job summing it up and I will add some of my perspective. The following is a quick rundown of our weekend two weeks ago. My vacation hours had been burning a hole in my pocket so I decided to take Friday off to enjoy some of the fall weather. This started with a viewing of the Reel Rock tour in Riverside. This showing, at the Threshold Gym, was a bit unconventional and only featured part of the tour. Even though we were looking forward to seeing more films we still got to see the Sharp End and the Big UP dose from South Africa. I was impressed by the number of young people in attendance at the showing. It seems that Threshold, which is located close to UC Riverside, is able to draw a much different crowd than Vertical Hold. At Vertical Hold there seems to be a lack of college age students which is odd since UCSD is nearby. Perhaps they go to the smaller climbing wall at the university or the nearby Solid Rock gym. Before the movie started I had a nice chat with Louie Anderson who was in attendance and got some route beta for our upcoming Red Rocks trip which ended up being helpful. The Sharp End was fun and it was great to see everyone putting it on the line. Like others have mentioned there was a lot of non-climbing footage and I would have liked to see more climbing action. 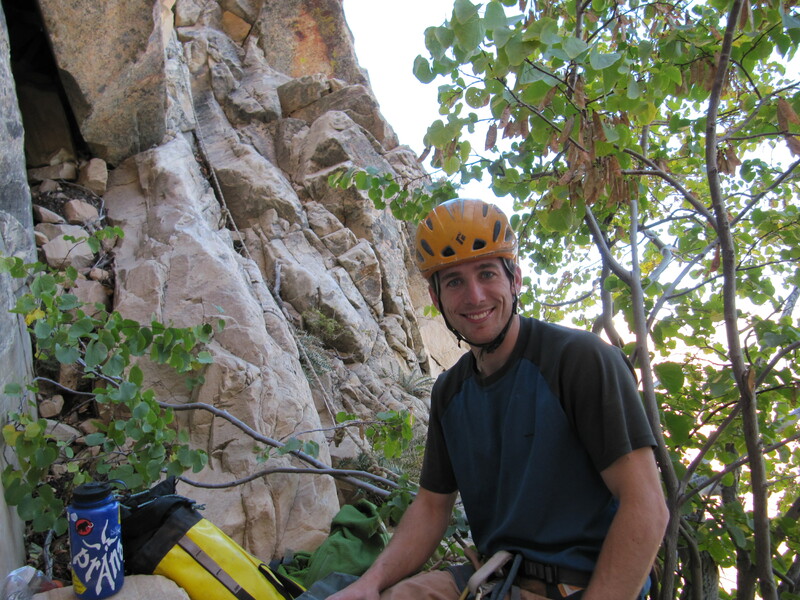 Seeing Ammon on El Cap was nice but short and the section of climbing in the Czeck Republic really stood out. Overall it was a great collection of stories and I want to watch it again to see more of the details in regards to the specific climbs. As previously mentioned the weekend at Jtree was cold. We did a frigid ascent of the Left Ski Track which was quite hard and a bit awkward. We hung out with my cousin, her husband and their two daughters and we spent a bunch of time out at Equinox. I worked Equinox on TR and found a bit of an easier way to do my crux. I was able to re-sequence and do a series of smaller moves which should be easier when fatigued. Lizzy had a go and unlocked a bit more beta, finding a finger stack to get her through the wider top section. After doing the top section clean a few times I was able to do the whole route on TR with one fall, removing the gear as I went up. Since it was my third try my fingers were quite torn up and I was happy with my progress. My cousins departed after breakfast on Sunday to continue their road trip to Scottsdale, AZ so Lizzy and I relaxed, waiting for Equinox to come into the sun. We were a bit unsure of the correct time so we decided to hike out and see how cold it was. For reference the route came into the sun slightly after 2pm. The wind had picked up from the day before and it was really cold at the base of the route. Stubbornly I scrambled to the top and had Lizzy lower me over to work the moves and place all the gear for a lead attempt. While I was not quite ready to redpoint the route I thought that climbing it on pre placed gear would be a good first lead attempt. Lizzy suffered in the cold as she patiently waited for me to work out the moves. Putting in some gear on Equinox. After heating up in sun for a while we pulled the rope and I tied in. I had my best link on the first section and it felt great. I hit all the jams and in no time I was right before the crux. I was a bit intimidated so I hung and shook out to get the energy back. It took me a few tries to get through the middle section and I had to hang on gear to work through the moves. Eventually I made it to the last section but half way across the final traverse I ran out of confidence and hung again. Next try I committed to the moves, placed a few more cams and topped out. I felt good with the first and last sections but was pretty worried about the middle. Hopefully I can get a bit more confident by working more on the moves and try it again next weekend. 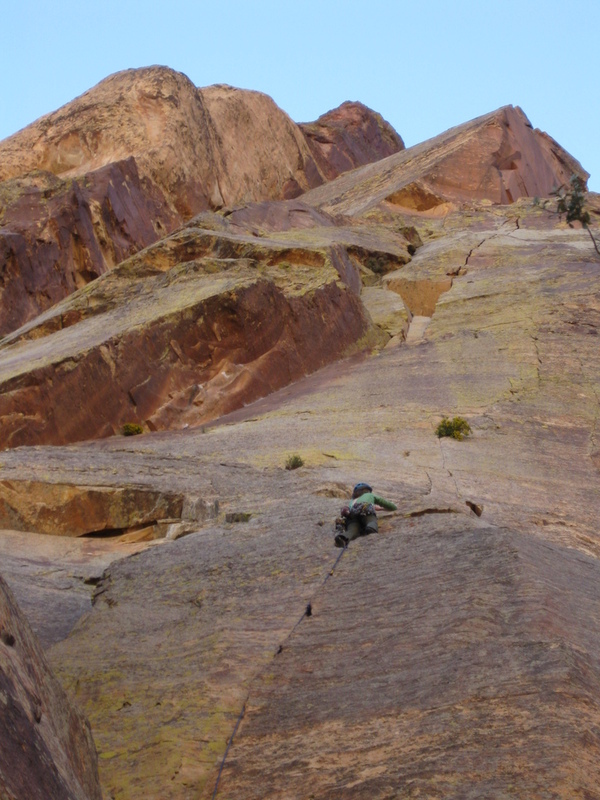 This past weekend we hit up Red Rocks for a few hard multi-pitch routes. We were afraid of cold weather but it ended up being perfect. We climbed in the shade in pants and had no wind. On Friday after our drive out we did Only The Good Die Young, 11c – 5 short pitches. 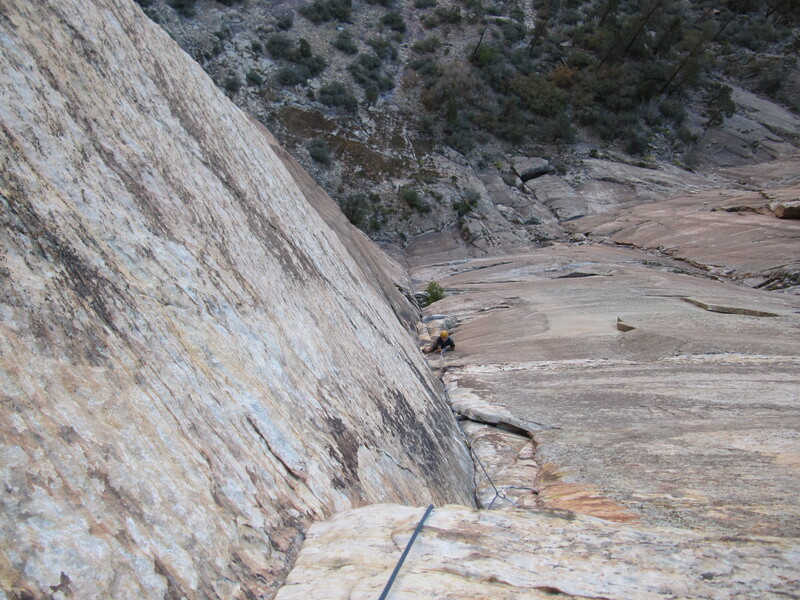 On Saturday we had a long day on Cloud Tower, 11d 7 long pitches that ended in darkness and a stuck rope. Sunday we did a bunch of easy sport climbs in the Black Corridor. I was trying to work some endurance so I ended up doing 9 routes 10d or easier. It was a crazy gym like environment but the routes were quite fun. We had a great weekend despite a bit of silly traffic on our drive back. Lizzy or I will have a formal trip report in a few days.